If you've ever been to one of my stamp-a-stacks you know how I feel about this stamp set - I love it! And many of you feel the same way! By coloring directly on the stamp with your markers, you can create a soft watercolor"ish" look to create a nice subtle image. It seems like I have used this set a lot lately, and it is purely coincidental. But when it went on the list of retiring stamp sets, I had to use it one more time at my Going, Going, Gone Stamp-a-Stack. It's a little subtle, but we used the Daisy Dash jumbo wheel on the second layer of Pink Passion. The pink circle is a much bigger stamp that is punched with the 1/2 inch circle and popped up with a dimensional. This is another all purpose type card and could be for many occasions if you choose to leave off the other words that come with the set. Last night we had a Going, Going, Gone Stamp-a-Stack featuring only retiring stamp sets. 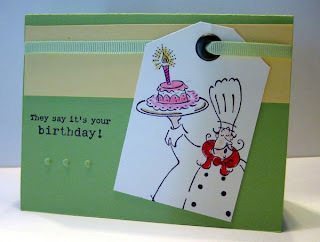 We also used a lot of retiring colors of ink and cardstock, and on this card, we used retiring Designer Series Paper too. 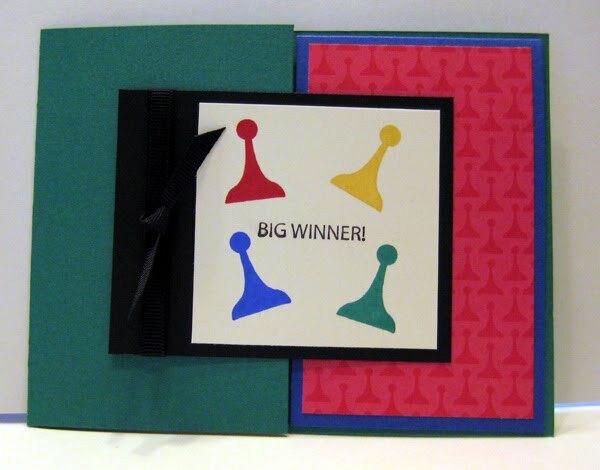 This stamp set, Game Night, was a good one to use because it also includes dominoes, dice and other game pieces, so most people were able to make each of their cards look a little different. 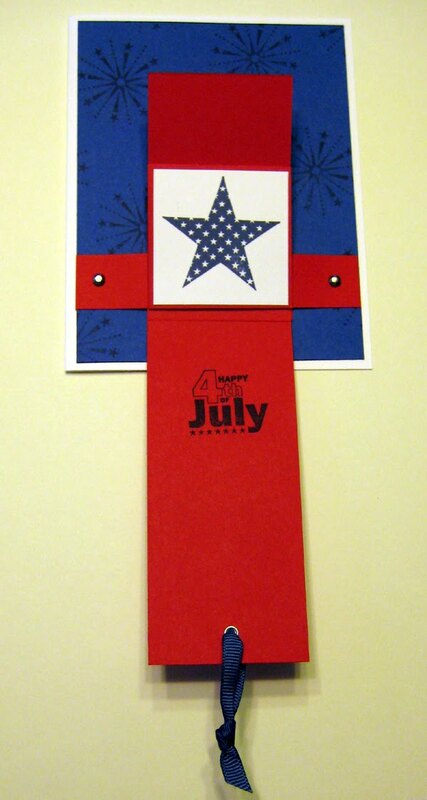 It's also a fun card because there are so many flaps for the recipient to open. This card uses two new hostess stamp sets and two returning (former In-Colors) colors. It was so much fun inking up these brand new stamps for a swap I am participating in with other demos. 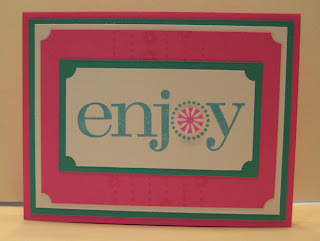 I used Pink Pirouette and Wild Wasabi to color directly onto the stamp. For those of you who already own those ink pads, there are now markers to match! 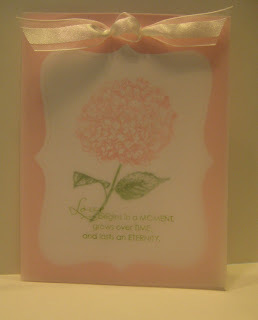 I liked the soft look created by layering vellum paper and then stamping the words on the top layer. Stampin' Up! 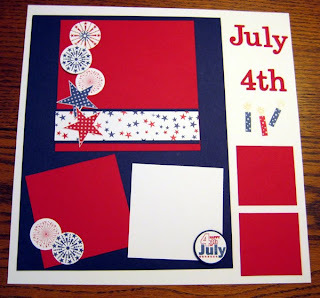 gave us demonstrators the Just Because set, and I think I will be getting a lot of use out of it - I even stamped the hydrangeas on the envelope I used to mail my swaps! 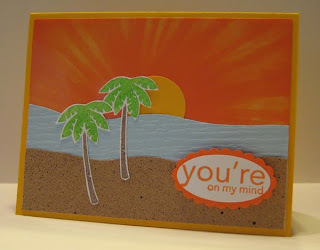 This is a summery card for what promises to be a very hot day today! It's made with a combination of current and soon to be retired stamps. 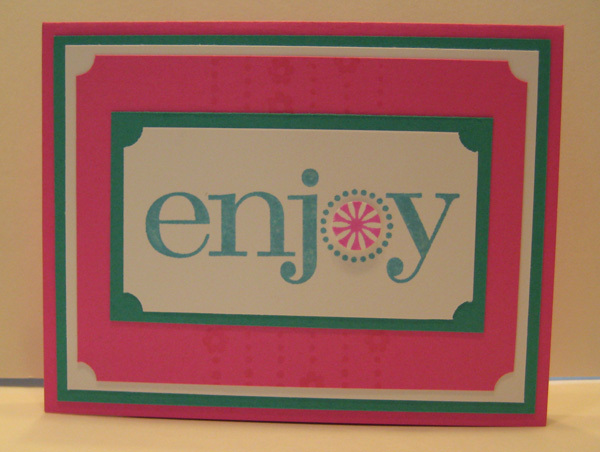 The Enjoy Every Moment stamp set will retire at the end of this month, but the Tart and Tangy set is sticking around. Have you checked out the clearance rack lately? 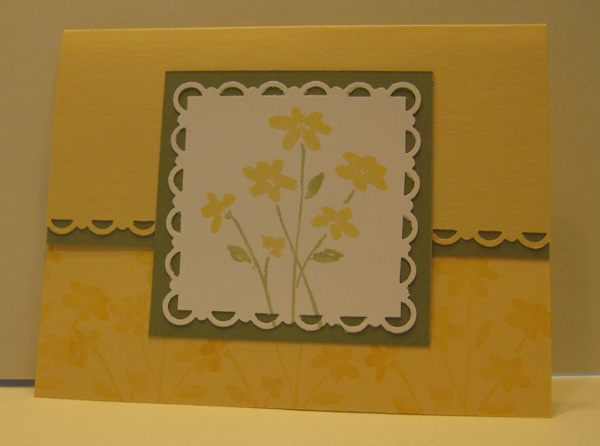 Here are two cards made with one of my all-time favorite Designer Series Papers, Summer Picnic. It is on clearance for $3.99, regularly priced $9.95. Just go to my online store and click clearance rack on the left to start bargain shopping. 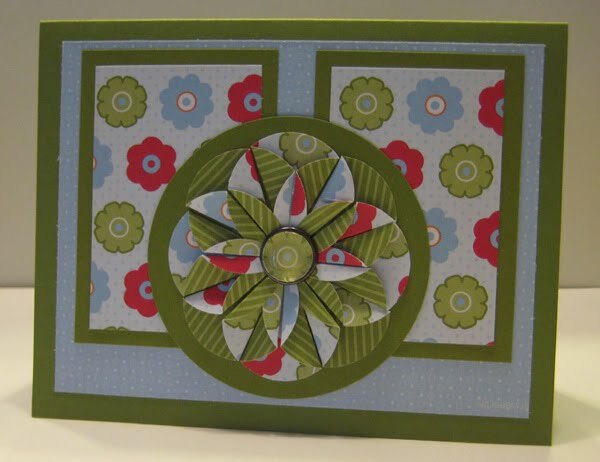 The green card features another Dahlia Fold and a Build-a-Brad in the center. For dahlia directions see this post. Purchase this Sweet Scoops Class kit “to go”, and you’ll make 4 “sweet” cards with a matching chipboard tote to keep for yourself or give as a gift. Each class kit will include pre-cut, pre-embossed, pre-punched cardstock, embellishments and printed directions with photos. You provide the ink and stamps at home. Class fee: $15, but for your best value, order the Sweet Scoops stamp set, and save $5 off of your class fee (plus postage if you aren’t local). Please RSVP (217-483-9195 or email me) by July 9. Your to go kit will be ready for you to enjoy a couple of short weeks later! This card was inspired by a beautiful birthday card I received from Cheryl Camp. 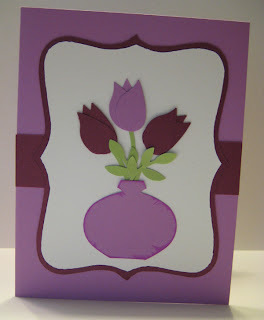 I had resisted buying the 2-step bird punch.... until I realized I could make tulips with it! Thanks Cheryl! So after my birthday, I ordered the punch and knew this would be a June stamp club project. Each tulip uses 3 wing pieces from the 2-step bird punch. The stems and leaves come from the same punch and the vase is made with the ornament punch (cut the tip off). The faux frame was created by punching two Top Note pieces and cutting the Whisper White on the dotted line. What a great way to use these punches, huh? 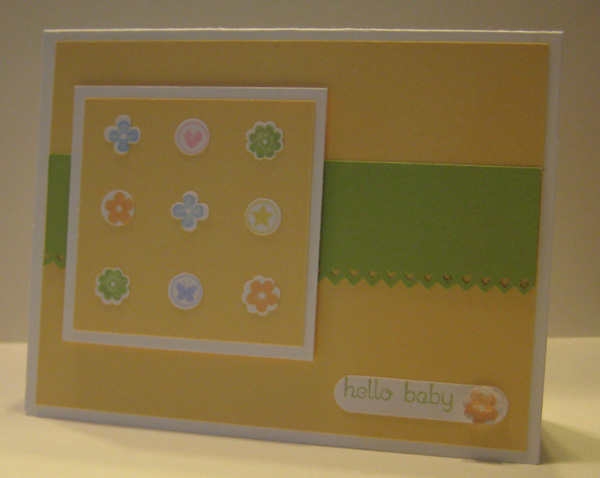 The new Itty Bitty Bits stamp set, coordinating punches and Bitty Buttons from the summer mini catalog made this a simple baby card. 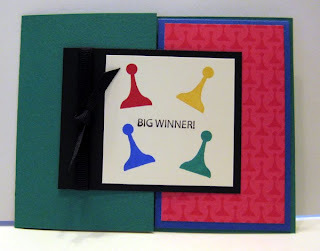 You could easily chose different colors if you wanted to make a gender specific card. We made this in stamp club and I wanted to do a general card so I went with Barely Banana and Certainly Celery. The hello baby came from Teeny Tiny Wishes, and we finished it off with a Bitty Button. This stamp club project features the Bouncing Brayer technique. And it's one of those cards that started as one idea and before I was done, it was a completely different card. It evolved into a sunrise/sunset card simply because I chose Only Orange for my first try, and the orange looked like rays of sun. For the water, I ran my Bashful Blue through the Big Shot with a texturz plate, and for the sand, I spritzed it with Log Cabin Smooch Spritz. For Bouncing Brayer, you ink up a brayer and place one end of the brayer in the center. Turn your cardstock as you tap the brayer and occasionally give it a slight roll. The one end needs to stay close to the center the entire time. You may need to reink, and you will probably need to go around again. 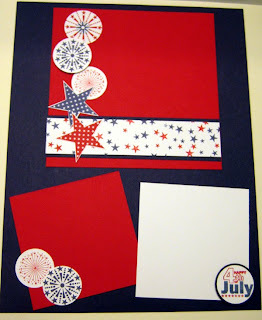 Another option is to roll over your cardstock like you would normally to fill in the white spaces. 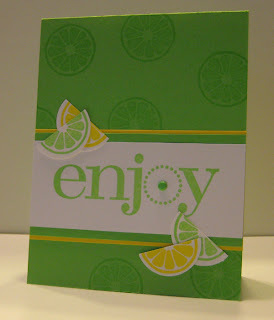 I used glossy cardstock, but it also works with regular Whisper White, and you can do more than one color. It can be very striking when you stamp a large solid image over the center, but for my purposes, I only used half. My upline, Meg, hosts a quarterly event for downline members who have met certain qualifications. I was fortunate enough to be able to participate and receive "wow" swaps from other very talented demonstrators. 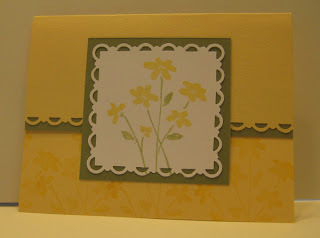 The one from Debbie Jones was just perfect for this month's stamp club. It is a waterfall card featuring the July Fourth set from the Summer Mini catalog. If you didn't think you needed this set before, you will now! 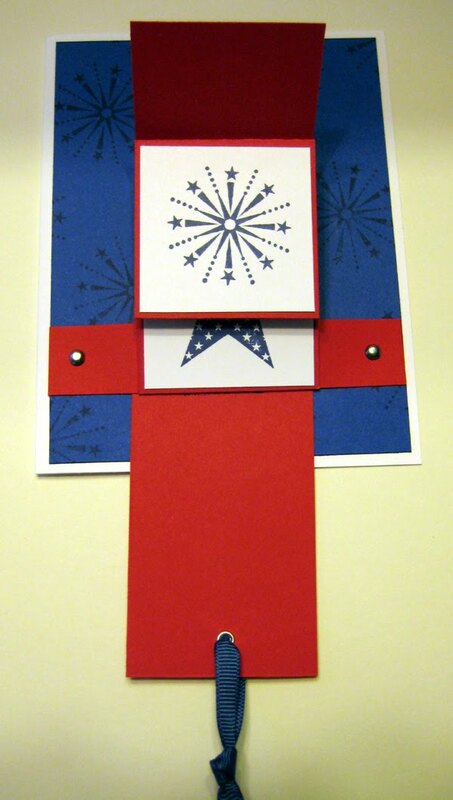 Here is my version of her awesome card. Thanks Debbie! Pull the ribbon tab and watch the waterfall! 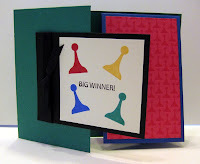 The great thing about waterfall cards is that they are so impressive but really not that hard to make. You can find a step by step tutorial at Splitcoaststampers.com if you want to try your own. 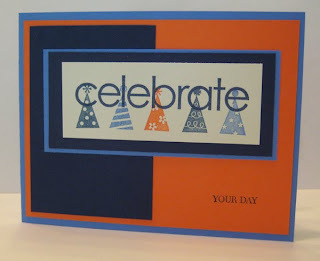 I am getting as much use out of this Celebrate Everything stamp set before it retires at the end of the month as I can. It has definitely been a well used set and one of my go-to sets for words. 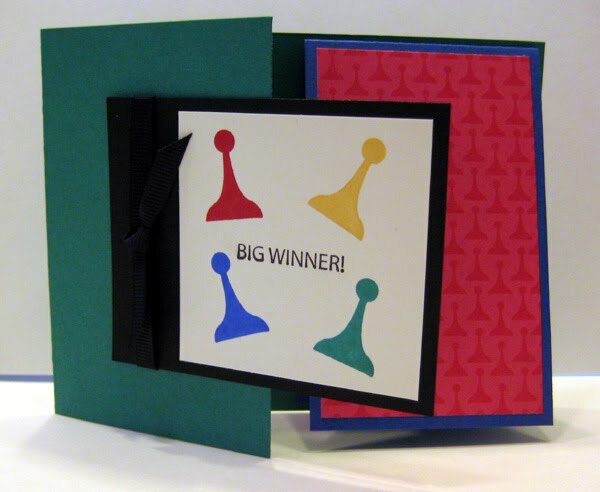 We made this card at my last Stamp-Stack, and several people made it into a Father's Day card by stamping some of the images from the Wanted stamp set in the background instead of party hats. The Ballet Blue and Only Orange are also retiring, but with the Night of Navy, they made a card that can go to almost anyone of any age. 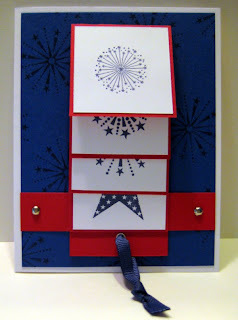 This is one of the Stamp-a-Stack cards we did this weekend. I used soon to be retiring colors, but the stamp set is brand-new! It's a Level 2 hostess set, Punched Posies, from the Summer Mini Catalog. 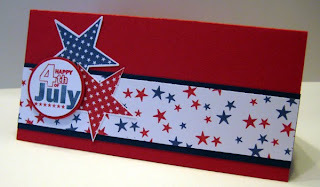 It's a great set because so many of the stamps coordinate with one of our punches which makes for some quick cutting! Our Stamp-a-Stack theme was birthday, but this card could just as easily be stamped with another cheerful greeting or left blank on the front. Please contact me about hosting a workshop or collecting orders from friends and submitting a book party to get this great hostess only stamp set! 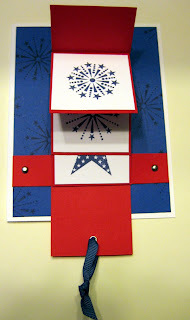 Here's a sneak peek at one of our stamp-a-stack cards for this weekend. 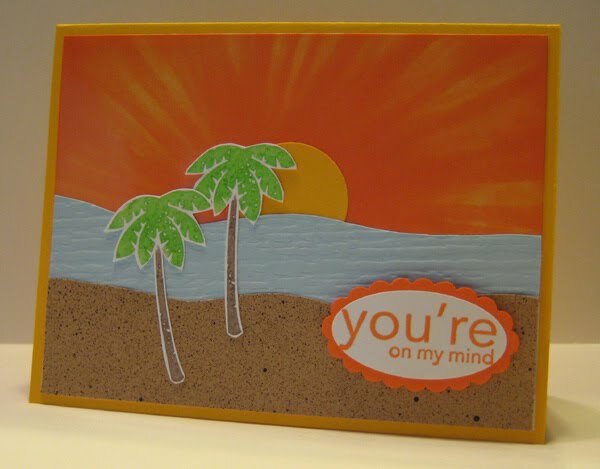 We are making birthday cards, and I think this set is perfect for a summer birthday! I stamped the cone with soon to be retired Creamy Caramel. 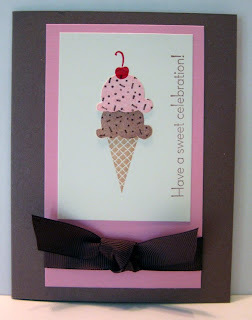 I stamped the ice cream and cut it out, using Close to Cocoa (also retiring) and Pretty in Pink ink. Stampin' Up! has announced the retiring stamps and accessories for this current catalog to make way for some great new products when the new Idea Book & Catalog come out July 1. Click here to download a list of retiring stamp sets. Click here to download a list of retiring Definitely Decorative. Click here to download a list of retiring accessories. You will want to act fast if there is something on the accessory list you want - those are only available while supplies last. 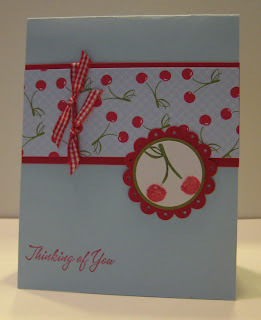 Here's a card made with the soon to be retired Voila stamp set. 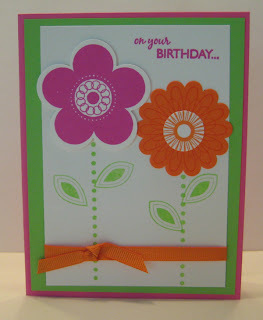 The great thing about having stamping friends is that they share! I never owned this guy, but I have borrowed him many times! 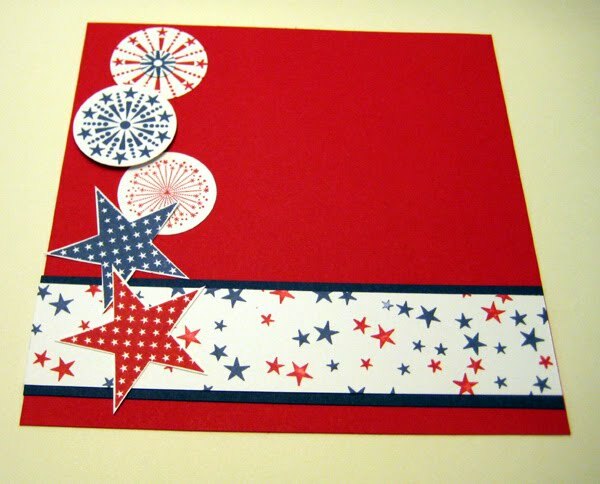 I used the Crop-a-dile for the three embossed dots under the greeting and also to set the jumbo eyelet.